The Alexa Skills Kit supports implicit grants for account linking in custom skills. You cannot use this grant type for other types of skills, such as smart home skills. Important: In implicit grant, your authorization server provides the access token directly after the user authenticates with the other service. This flow does not support access tokens that expire. If the access token expires, the user must re-link their account, which is a poor user experience. Therefore, implicit grant is not recommended for most skills. Implement authorization code grant if possible. Users can start the account linking process when enabling the skill, or from a link account card in the Alexa app. For more about how users interact with account linking, see Account Linking for Custom Skills. The user starts the process by enabling the skill in the Alexa app or tapping a link on the link account card. The Alexa app displays a login page within the app, using the authorization URI you provide when you configure account linking. This login page lets the user authenticate with the authorization server. When the Alexa app calls the specified authorization URI, it includes state, client_id, response_type, scope, and redirect_uri as query string parameters. The user logs in using their credentials for the authorization server. Once the user is authenticated, the authorization server generates an Access token (access_token) that uniquely identifies the user. The authorization server redirects the user to the specified redirect_uri and passes along the state, access_token, and token_type in the URL fragment. The Alexa service saves the access_token for the Alexa user. The user's Alexa account is now linked to the account in your service, and the skill is ready for use. When the user makes requests to the skill, every request sent to the skill (such as an IntentRequest) now includes the access token (access_token). Your skill uses this token to get the information you need from the Resource server. 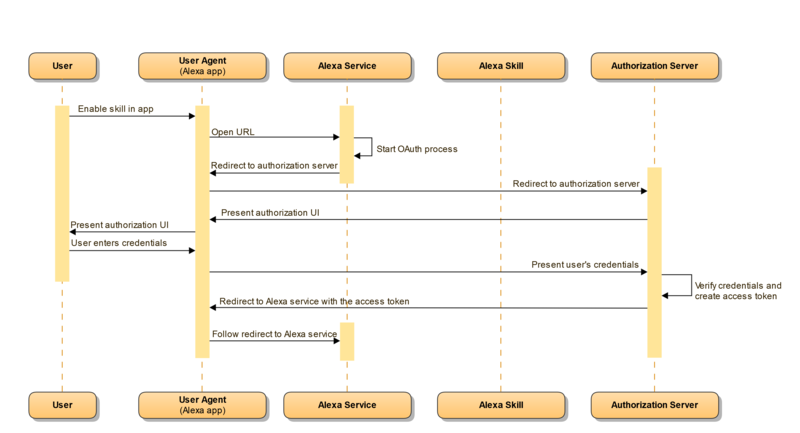 The following diagram illustrates the initial setup when the user links their account and Alexa obtains the access token from your authorization server. This diagram shows the flow when the user makes a request to the skill and the skill then uses the access token to retrieve information from the resource server. The authorization server must be able to accept the required parameters, authenticate the user, generate the access_token, then redirect the user to the Amazon-provided redirect_uri. See Authorization URI for details. Configure your skill for implicit grant in the developer portal. See Configure Account Linking in the Developer Console for details. When a user starts the process of linking accounts, the Alexa app displays a login page for the authorization server. The authorization server needs to validate the user's credentials and then return an access token. You specify the URL for this login page in the developer console on the Build > Account Linking page. You provide the URL for the login page in the Authorization URI field. If you use a third-party OAuth provider, see the documentation for that provider to determine the authorization URI you need when you configure account linking. Look for the URI for an authorization request. The Alexa app includes the following parameters in the URL query string when it calls your authorization URI. An identifier for your skill. You can use this to provide any skill-specific functionality, such as distinguishing between different skills you have configured with account linking. You define the client_id when you configure account linking for your skill. The Amazon-specific redirection endpoint (redirect URL) to which the service should redirect the user after authenticating the user. The values you can expect for this parameter are also displayed in the developer console when you configure account linking for your skill. Indicates the type of response that should be returned after the user has been authenticated by the other service. This is always token for implicit grant. An optional list of scopes indicating the access the Alexa user needs. You define these scopes when you configure account linking for your skill for your skill. The service can use this information when generating the access token. For example, a service could create a token that allows access to basic profile information in the resource server, but does not allow access to payment information. Multiple scopes can be used. The list is delimited by URL-encoded spaces. The login page should tell users what access they are allowing by linking their accounts. For instance, your login page could display text such as "This allows the Car Fu skill to order a taxi on your behalf and charge your account for the cost." For a smart home skill, this page might display "This allows the My Lights skill to control lights connected to your My Lights hub." A value used internally by the Alexa service to track the user through the account linking process. The authorization URI must pass this value back (unchanged) when calling the redirect URL. The Alexa app attempts to use the user's browser language preference to display a localized version of the app if the user's browser is set to one of the supported languages . For other languages, the app defaults to en-us. For a consistent user experience, your login page should also render in the same language as the Alexa app. To get the language, check the Accept-Language header first. The Alexa app attempts to set this when calling your authorization URI. If the header is not set, you can use the language defined by the user's browser by checking navigator.language or navigator.browserLanguage. See Navigator language Property. Note that the user's browser settings are independent of the language defined on the user's Alexa-enabled device. For example, a user could configure their device to use German, but configure their browser to use UK English. In this case, the Alexa app renders in English and the Accept-Language header is set to English (en-gb). The Alexa app displays the login page you specify when the user begins the account linking process. Be sure to provide a good user experience for users who are already using your service, and new users who discovered your service through Alexa and may want to create an account with your service. The username or email field on the login page should turn off the auto-correct and auto-capitalize options to reduce the likelihood of entry errors. Use form-field validation to catch common errors such as trailing spaces and incorrect capitalization. For fields such as postal codes or phone numbers, make sure your validation logic is correct for each region your skill is accessible in. The page should provide instructions about the user credentials it expects. For example, make it clear that the user must log in using credentials for your service, not their Amazon account. If you are using a third-party authentication server, make it clear that the user must log in with credentials for that server. If the web site or mobile apps for your service support multiple sign-in mechanisms such as Facebook, Amazon, or Google, make sure your login page supports the same mechanisms. Otherwise some users who use your service will be unable to link their accounts. If your web site or mobile apps for your service support creating new accounts, support and test this flow as well. Consider that a user might encounter your service for the first time through Alexa, so that user needs to be able to seamlessly create and link a new account. Support account recovery options for users who have forgotten their account names or passwords. Test the account linking flow with all of the above scenarios to ensure that your page gives users a good experience. Make sure that your error messages are clear about the problem when the user is unable to log in. See also 10 Tips for Successfully Adding Account Linking to Your Alexa Skill. It must be served over HTTPS. It must provide a mobile-friendly login page, as it will be displayed within the Alexa app. It must accept the user's credentials and then authenticate the user with the authorization server. It must generate an access token that uniquely identifies the user in the resource server. It must keep track of the state value passed in the query string. After authenticating the user, the page must redirect the user to an Amazon-provided redirection endpoint (redirect URL). The URL to use is included in the authorization request as the redirect_uri parameter. Additional URLs are also displayed in the developer console when you configure account linking for your skill, so you can see the possible values your login page should expect in the redirect_uri parameter. Include the state, access_token, and token_type in the URL fragment. The token_type should be Bearer. Note that the parameters are passed in the URL fragment, which is the portion of the URL after the hashtag (#). This token is included in the redirect URL after the user is authenticated. Note that implicit grant does not support refresh tokens, so if the token expires, the user will need to re-link the accounts, resulting in a poor user experience. If you want to use expiring tokens (recommended), use authorization code grant instead. When generating the access token, provide a token specific to your resource server. For security, your token should be a value that identifies the user, but cannot be guessed. You enable account linking in the developer console in the Build > Account Linking section. Alternatively, you can configure account linking with the ASK CLI or the Skill Management API. Note: Account linking is optional for custom skills. However, once a custom skill with account linking has been certified and published to users, you cannot disable account linking for that skill. The following table summarizes the fields you must fill in to configure account linking. If you use a third-party OAuth provider, see the documentation for that provider to determine the values to enter in these fields. Do you allow users to create an account or link to an existing account with you? Select this to enable account linking for a custom skill. This option is automatically selected for smart home and video skills. Select this to let users bypass the account linking flow when they enable your skill. Available for custom skills only. This is useful if your skill offers meaningful functionality without an account, in addition to the features that require an account. See Let Users Enable Your Skill without Account Linking. This option is off by default. The OAuth 2.0 authorization grant to use to obtain the access token. Select Implicit Grant. The URI for a page the user can use to log into your service. The Alexa app displays this page when the user begins the account linking process. Refer back to Authorization URI for details and requirements. For a third-party OAuth provider, look for the URI provided for authorization requests. For example, for Login with Amazon, the authorization URI is https://www.amazon.com/ap/oa. A unique string that identifies the client requesting authentication. This value is passed to the authorization URI in the client_id parameter. For a third-party OAuth provider, look for the client identifier that the provider expects. For example, for Login with Amazon, this ID is created when you create a security profile for Login with Amazon. An optional list of permissions for the other service. If your resource server supports different scopes for access, enter those here. You can provide up to 15 scopes. All of the scopes entered here are included in the scope parameter (separated by URL-encoded spaces) when the Alexa app calls your authorization URI. For a third-party OAuth provider, specify a scope from the set of scopes that the provider supports. For example, Login with Amazon supports profile, profile:user_id, and postal_code. An optional list of domains that the authorization URI can retrieve data from. If your login page retrieves content from other domains, enter those in this list. This is only necessary for domains beyond your authorization URI. For example, suppose your authorization URI is https://www.carfu.com/login. If your page pulls in any content (such as images) from domains other than www.carfu.com, you need to add them to the Domain List. You can provide up to 30 domains. This displays the Amazon-provided redirection endpoints to which your login page must redirect the user after the user is authenticated. The value to use for a given request is passed to your login page as the redirect_uri parameter included with the authorization URI. See Redirection Endpoints. You can see the redirection endpoints Alexa uses in the Redirect URLs field on the Build > Account Linking page in the developer console. This endpoint is the URL to which your login page must redirect the user after the user is authenticated. Note Redirect URL displays multiple URIs. The Alexa app passes your authorization URI the value you should use based on where the user registered their device. The URI is passed to your authorization URI in the redirect_uri parameter. How you do this depends on the authorization server you are using. For example, in Login with Amazon, you need to configure a security profile and provide the possible redirect URLs in the Allowed Return URLs field. See the documentation for your OAuth provider to determine these requirements. Note: If you distribute your skill in multiple regions, your skill needs to use the correct region-specific Redirect URL. The URL to use is included in the call to your login page in the redirect_uri parameter. Once you have configured account linking, you can test the account linking flow. Use the Alexa app to enable your skill and start the account linking process. Verify that you can log in to the service and then return to the Alexa app.